A recent trip brings a flurry of deals, but suggests there’s more than just an economic dimension. Vietnam and Russia are relatively distant geographically, but their historic relationship has seen quite an impressive amount of co-operation and support. Recent deals made during Russian President Vladimir Putin’s visit somewhat revived the old relationship. Russia and Vietnam’s economic relationship was given a much bigger boost than Putin’s awkwardly close hug (picture here with Vietnamese President Truong Tan Sang might have suggested this week. The embrace came at the end of a large signing ceremony in Hanoi on Tuesday which featured deals involving some of the biggest companies from both countries. Rosneft and Gazprom, the (in Europe at least) well known Russian state energy giants were heavily featured in the agreements. Gazprom won a deal to supply energy to Vietnam’s growing economy via Russia’s Liquefied Natural Gas (LNG) facilities at Vladivostok. The company will also invest in a local refining and petrochemical company alongside Vietnam’s own state oil company, Petrovietnam. On the other side, Petrovietnam itself won the slightly bizarre right to explore for resources in the Pechora Sea in the Russian Arctic. Some may question the logic of having a Southeast Asian state oil company with experience limited to the warm waters of the South China Sea exploring for oil and gas thousands of miles away off the north-west coast of European Russia. However, the deal is not only symbolic in terms of the countries’ bilateral friendship (Russia rarely allows foreign firms such access), but also a possible quid pro quo, as Rosneft was also given preliminary approval to purchase an exploration block off the coast of Vietnam. With Russian interest in Vietnam’s prize Cam Ranh Bay Naval Base (which also has interest from the U.S.) some may see more than just an economic dimension to the deals agreed this week. 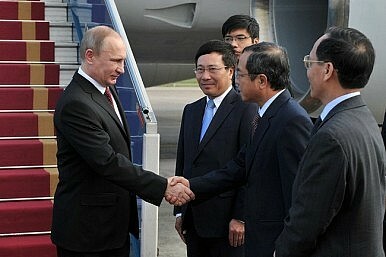 Indeed, Russia and Vietnam also signed a defense accord during Putin’s high profile trip. Russia will be supplying both training and a broader range of weapons to the Southeast Asian nation which significantly is currently engaged with a heated territorial disagreement with its giant northern neighbor China. Russia recently delivered the first of six submarines to Hanoi. To top things off, Russian nuclear energy firm Rosatom will help Vietnam build a nuclear power station, although Russia is not the only country interested in winning a piece of Vietnam’s future nuclear energy pie. Russia-Vietnam: Cooperation in the Arctic? The two countries look likely to strengthen ties in the energy sector.